While sitting down to enjoy turkey during the Thanksgiving holiday, remember that although wild and domestic turkeys are genetically the same species, that’s about where the similarity ends. Don’t ask a barnyard bird to try any of those feats! 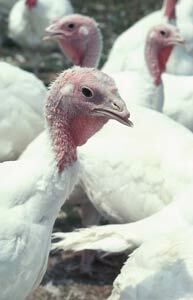 The domestic turkey lost its ability to fly through selective breeding that created heavier, broad-breasted birds, a feature much desired by chefs and commercial turkey producers. The shorter legs of the domestic turkey also mean it can’t run as well as its wild cousin. In contrast to the heavier domestic bird, the wild turkey is slim, tall and long-legged. Factor in its keen eyesight and native cunning, and the wild turkey makes a difficult target for human and animal hunters alike. Reintroduction of the wild turkey in South Carolina is one of the Palmetto State’s most noteworthy conservation success stories. Limited at the turn of the century to small pockets of birds in the Lowcountry’s Francis Marion National Forest and along the Savannah River swamps, the wild turkey is now so widespread throughout South Carolina that a month-long spring hunting season is held in all of the state’s 46 counties (there is no fall season). Wild turkey restoration was made possible through the efforts of the state DNR, the National Wild Turkey Federation, the forest products industry and South Carolina sportsmen and sportswomen. 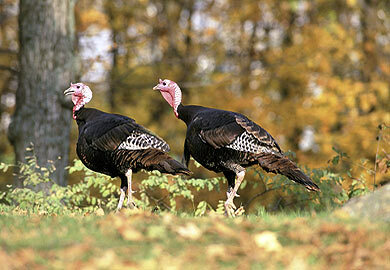 The separation of the wild and domestic turkey began hundreds of years ago, according to Ruth. 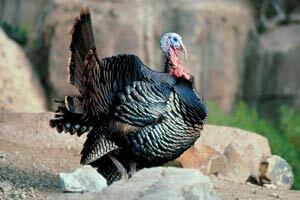 Native Americans had accomplished the domestication of turkeys before Europeans set foot on the continent. Turkey bones have been found in Indian burial mounds in Tennessee, Kentucky and some other parts of the South, and turkeys were being raised in Mexico and Central America for more than 500 years before the Spanish arrived. Turkey relics have been found in Arizona dating as far back as 25 A.D., and turkey-raising may well be one of the oldest forms of organized meat production in the Northern Hemisphere. Spanish explorers took Mexican wild turkeys domesticated by the Aztecs home to Europe in about 1519. The turkey then spread rapidly through Europe and was introduced in England between 1524 and 1541, where they were highly sought after for gourmet dinners. After the domestic turkey spread across Europe in the 1500s, the colonists who settled the New World brought these tasty birds with them across the Atlantic to the land of their origin. Imagine the pilgrims’ surprise to find the turkey already one of the most plentiful foods of the American Indians. Domestic stock from Europe was eventually crossbred with the wild turkeys of North America, leading to the six standard domestic varieties in the United States: Bronze, Black, Narranganset, Bourbon Red, Slate and White Holland. While the attributes of wild turkeys have been important in enhancing domestic breeds, the flow of genetic material in the other direction is not encouraged. State law prohibits the release of pen-raised turkeys due to the possibility of introducing disease into the wild flocks and because of the danger of contaminating the wild turkey gene pool. But Ruth said because domestic turkeys lack the “wood smarts” of their wild cousins, they generally fall prey to a host of hungry predators such as bobcats, foxes or coyotes before getting a chance to breed with native birds.